Red: By now we’re sure you’ve seen the power color infiltrate every facet of the fashion world. In fact, adding a touch of rich red here or a detail there will instantly make you look so cool and current. But instead of dipping your toes lightly in the trend, we recommend saturating your look from head to toe in the hue. As the holidays rapidly approach, party invites are flooding our inboxes, and we can’t help but think about what to wear to each holiday event. Something red definitely does the trick and is both appropriate for the holiday season and perfectly on trend (two birds, one stone). After all, is there anything that makes us feel more festive than an all-red outfit? Ready to make a bold impact this holiday season? Keep scrolling to see and shop the monochrome outfits that have us seeing nothing but red. Dress down a suit with sneakers and a simple T-shirt. Available in sizes 40 IT to 42 IT. Available in sizes IT38 to IT42. Put a red spin on the good old Canadian tux. Saturate those classic wardrobe staples in red: a peacoat, turtleneck, and cropped trousers look forward with white shoes. Available in sizes 000 to 16, petite 00 to 12, and tall 2 to 16. Play with textures and shades of red. We love the combination of knits and corduroy for fall. Simple does not equal boring—opt for pieces with cool graphics like striped track pants and a graphic tee. Make a red dress feel extra special by tying a printed silk scarf around your neck. Available in sizes 36 FR to 40 FR. Try this combo for your next holiday dinner party: wool coat + cropped trousers + heeled boots. Ground a breezy sleeveless dress with thick-soled sandals. Available in size 40 IT. Balance a pretty midi dress with cool combat boots. 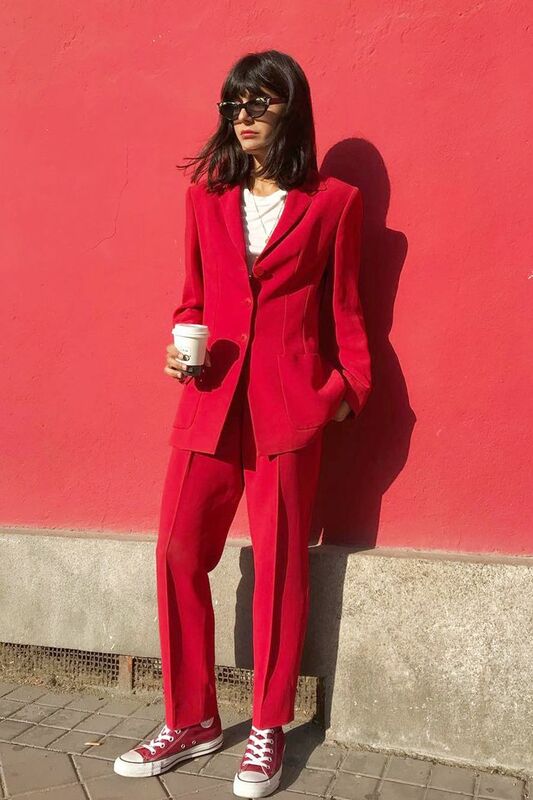 Give your suiting the monochrome treatment by swapping your staples like blazer, trousers, and pumps for bold red pieces. Need a little more convincing? Take a look at the best red dresses in fashion history.